Collaborators: Cached Collective, with Walid van Boetzelaer, Tim Maughan, Laurence Mence, Jake Charles Rees. Cached is an experience, that reveals your digital self. It explores how your online activity is interpreted by contemporary social media algorithms. And shows how machines perceive you and the assumptions they make about you, even if it's true or not. Once a visitor logs in on a tablet with their Facebook or Twitter profile, a mirror activates. 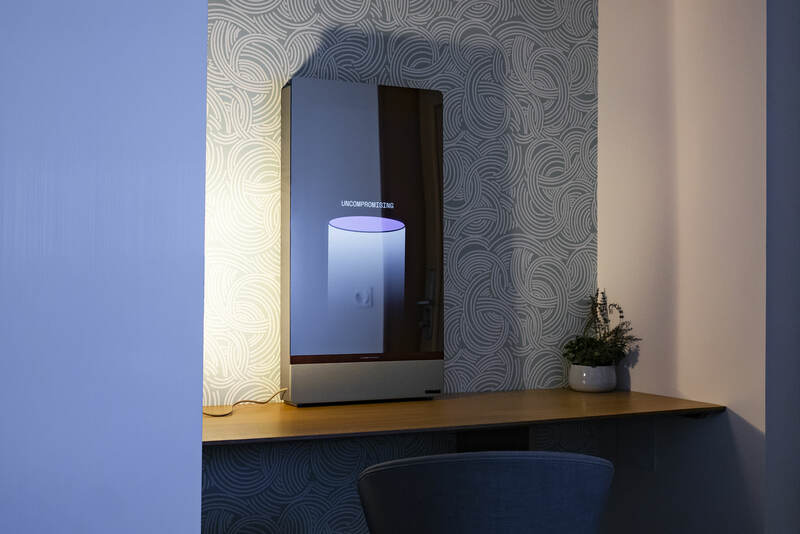 The mirror uses audiovisual storytelling to play a personalised experience. This explains how your actions online are perceived by algorithms. Our experience is powered by the IBM Watson psychometric algorithm, it analysis all the text found on your Facebook or Twitter posts. The words you use, the way you write, even the tone all contribute to the generation of a psychometric profile. Throughout the experience you learn that this algorithm and many like it, is also used to create a detailed profile of different users. The reason for this is so that advertisers or other entities can better micro target you. At the end of the experience the mirror prints out a receipt with a summary of the visitors analysis. This receipt is the only record of their data, since all personal data gets deleted. It is up to the visitor to decide what they do with it. Cached is an experience which allows oneself to think critically, about the version of themselves which exists online. 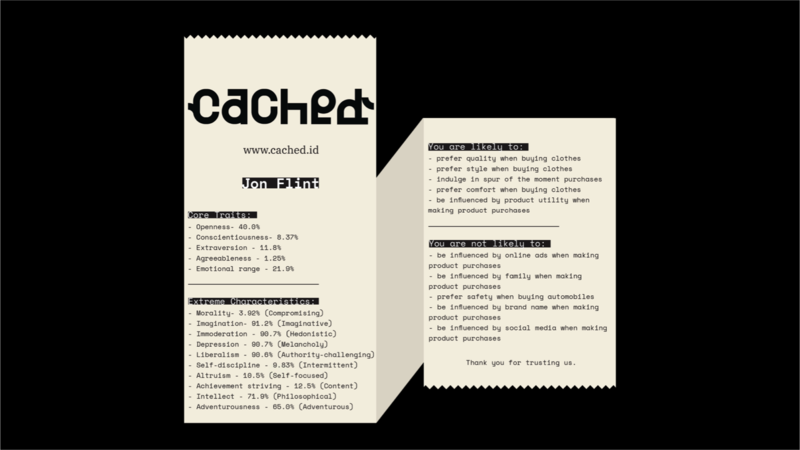 Cached is the result of a collaborative effort by the Cached Collective. The collective first met during a social innovation residency in the South of France, the Hive. The members of Cached include: Clément Bouttier, Ryan Dzelzkalns, Jon Flint, Vytas Jankauskas, Joana Mateus, Aline Martinez and Felipe de Souza. With modern technology becoming more and more complex. Our collective aims to design poignant experiences understood by wide audiences. Our interests examine data, algorithmic complexity, and obscure infrastructure, especially focusing on how these affect the individual. Since our formation at the Hive. We have gone on to lead workshops, talks and present Cached globally. Check out how our recent workshop and talk in Shanghai went, as well as more events here. Cached Collective, with Walid van Boetzelaer, Tim Maughan, Laurence Mence, Jake Charles Rees.